In an NMOS, does current flow from source to drain or vice-versa? The above image confuses me. For the N-channel, it shows the diode's polarity going towards source in some, but away from the source in others. I'm wondering which terminal should be connected to the power source (i.e. the positive battery terminal) and which should be connected to the power user (i.e. electric motor). 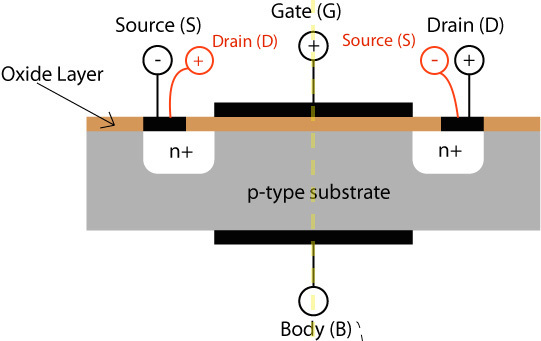 Conventional current flows from Drain to Source in an N Channel MOSFET. The arrow shows body diode direction in a MOSFET with a parsitic diode between source and drain via the substrate. This diode is missing in silicon on saphire. 2a is a JFet so different topology. \2e is a depletion mode FET - it is on with no gate voltage and takes negative voltage to turn the FET off. So diode has other polarity otherwise body diode would conduct whenever there was gate voltage. When a channel exists in a MOSFET, current can flow from drain to source or from source to drain - it's a function of how the device is connected in the circuit. The conduction channel has no intrinsic polarity - it's kind of like a resistor in that regard. The intrinsic body diode inside the MOSFET is in parallel with the conduction channel, however. When the conduction channel is present, the diode is shunted and current flows through the path of least resistance (the channel). When the channel is off, the diode is in circuit and will either conduct or block depending on the drain-source current polarity. As your picture shows, there are both N-channel and P-channel devices, as well as enhancement mode and depletion mode devices. In all of these cases, current can flow from source to drain as well as from drain to source - it's just a matter of how the device is connected in the circuit. Your picture does not show the intrinsic diode in the devices - the arrow point towards or away from the gate is an indication of the channel type (N-channel points towards the gate, P-channel points away from the gate). This symbol shows you the inherent diode between drain and source. N-channel delpetion devices have a channel by default, and need a voltage on the gate lower than the source in order to turn the channel off. The channel can be widened to a certain extent by increasing the gate-to-source voltage above 0. P-channel depletion devices also have a channel by default, and need a voltage on the gate higher than the source in order to turn the channel off. The channel can be widened to a certain extent by decreasing the gate-to-source voltage below 0. In the diagram above, the words P-channel refer to the type of channel that forms underneath the Gate. The P signifies that the channel forms on P-type semiconductor, while the N signifies an N-type semiconductor. With respect to the confusion. you're right, it is confusing. What you're seeing is known as a source-body tied terminal. In some applications this is useful (see below for more.) Ignore it for the time being. 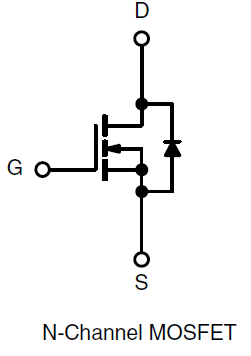 Generally, when examining an analog circuit schematic, it is conventional to see arrows on the Source terminal of the transistor. When examining digital transistor-level schematics (as opposed to gate-level, i.e. AND, OR, XOR gates), conventionally, there are no arrows. The distinguishing aspect is that the PMOS will have a little bubble at the Gate terminal, while the NMOS won't have any bubble. Be assured, they are in fact the same transistors (both PMOS and NMOS) in both analog and digital applications. But the way they are operated is very different. Modeling a transistor is highly complex undertaking and is an electrical engineering or applied physics discipline in itself. Any introductory textbook in microelectronics usually starts a chapter mentioning p-n junctions (a type of doped silicon semiconductor). Yes, the current can flow from drain to source and vice-versa. To simplify it even further, I would like to add a bit to just what @Adam Lawrence has mentioned. I am sure you are familiar with the cross section of the CMOS transistor. You can see that the cross section of the Mosfet is EVEN from the center vertical line. So, whichever (out of the two terminals on sides of nmos) terminal has higher voltage than the other terminal, that becomes your drain (for NMOS) and the other terminal with lower voltage becomes the source (for nmos). The reverse is followed for pmos. Nevertheless, be careful when buying/dealing with discrete 3 pin Mosfets (i.e SiHG47N60EF) where internal bulk is already connected to the source(for nmos) or to the drain (for pmos) internally. This makes the mosfet pins predefine as mentioned in the datasheet. In that case, the above is still true that higher voltage terminal is drain and lower voltage terminal is source for nmos. However, if you apply higher voltage to the predefined source as mentioned in the datasheet, the threshold voltages will not be same as mentioned in datasheet. And your transistor will not behave as same as what is specified in the datasheet. Not the answer you're looking for? Browse other questions tagged mosfet nmos polarity or ask your own question. MOSFETS +/- Voltages? Which to use? Is the bulk output deliberately used in DRAM cells?